A jolly Fast Snail balances on a single skate. Is there anything that crazy Snail can't do? Inside, the greeting reads "Wishing you all the joys of the season" in Liz's curly-whirly handwriting. 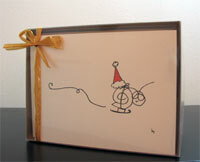 You may also choose to order this clever card as a blank note. Ink drawing printed on heavy white stock from sustainable forests. Set of eight 5 1/2" x 4 1/4" cards and matching heavy white envelopes. Packaged in kraft box with golden raffia bow.